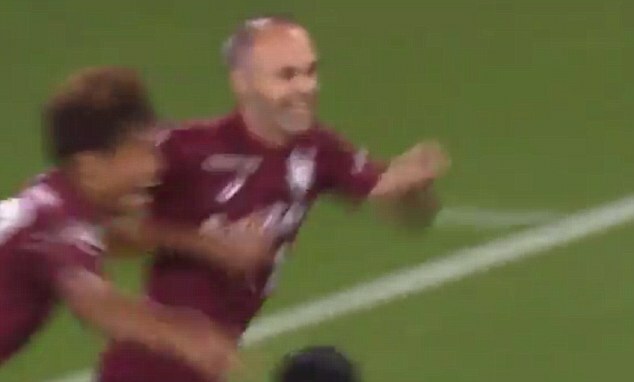 Andres Iniesta has got himself off the mark in Japanese football in sublime style, scoring his first goal for J League side Vissel Kobe in their 2-1 victory over Jubilo Iwata on Saturday. 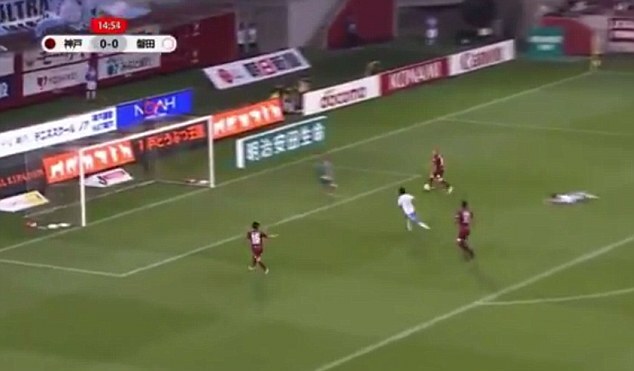 The Spanish midfielder icon, who moved to Japan following an illustrious career with boyhood club Barcelona, scored a sensational goal to open his account. Receiving the ball from out wide by former Arsenal and Germany forward Lukas Podolski, Iniesta brought it into his stride by executing a sublime turn to take the last defender out of play. 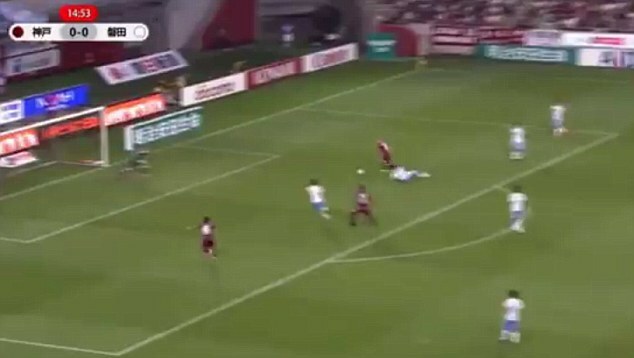 Podolski slid the ball through to Iniesta in the penalty area and the 34-year-old displayed all his trademark intelligence to pirouette past an Iwata defender before rounding the goalkeeper and rolling the ball into the net. 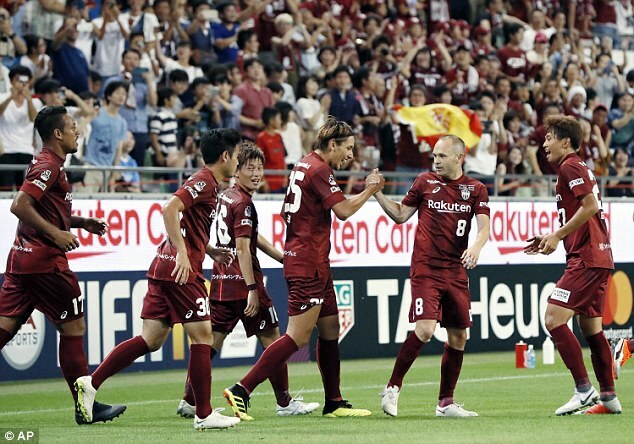 Iniesta’s goal opened the scoring in the 15th minute of the tie and a further goal from forward Kyogo Furuhashi later wrapped up victory for his new side. Social media was soon awash with reaction, with the football world keen to have their say on Iniesta’s brilliance. Many fans marvelled at the fact he still has such impeccable touch, while others were quick to remark on how the goal looks better the more it is watched. ‘Wowzer,’ was the reaction of England legend Gary Lineker, who shared the goal online with his 7million followers. Kobe moved up to fourth place as they look to close the gap on J League leaders Hiroshima Sanfreece, who beat Nagasaki to maintain an eight-point lead over Tokyo FC in second. Iniesta himself later took to social media following the game, sharing a picture of himself and his new team-mates in the dressing room along with his reaction to the match. ‘Very happy for today’s victory! Come on Vissel Kobe! Now heading for Wednesday’s game,’ wrote the football legend. 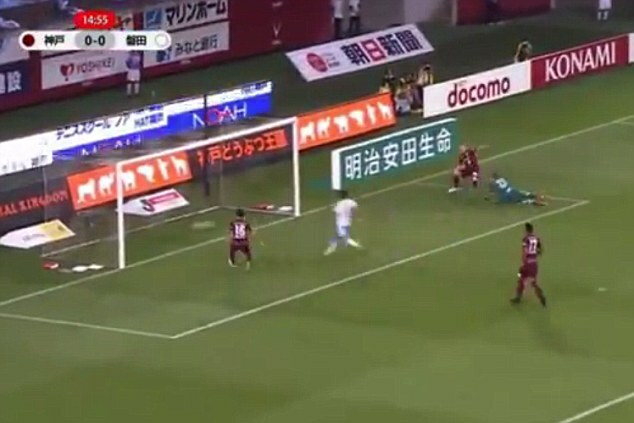 Iniesta’s former Spain team mate Fernando Torres failed to open his account for Sagan Tosu, although the struggling team did secure a 1-0 victory over Urawa Red Diamonds in their battle against relegation.